It’s hard to believe, but we’re in a new year. As I get older, it’s amazing how fast the years fly by. With growing kids and a business to run, it seems like it’s all I can do to stay on task and reach my goals throughout the year. I’m not a fan of New Years resolutions as they tend not to be quantifiable, which cuts down the likelihood of success. But that doesn’t mean you should give up on goals altogether. You can be very successful at reaching goals; you just need to personalize them, have fun and be realistic. Quantifying your goals as well will certainly help you be more effective. If you’re wondering how to start off 2018 on the right foot, here are seven simple goals to set to have a great year. I love to read for pleasure. It really doesn’t matter the genre of the book; I just enjoy reading. The problem is that I get busy and reading a book for pleasure becomes more of a remote possibility than a reality. What I’ve found to be helpful is to pick one book to read at some point throughout the year. If I commit to that now, I know I’ll have a much better chance of success. It doesn’t necessarily have to be a book on personal finance. In fact, I’d recommend something more fun if time is of the essence. However, if you do want to go the finance route, there are many personal finance books on Amazon to select. You can even select from the best investing books for beginners if you’re new to investing and want to get started. Reading has many benefits, and it’s no surprise that it’s one of the best money habits many self-made millionaires follow to expand their knowledge. This was something I learned when I first started paying off debt. I had no idea how to manage my money effectively and the credit counselor I worked with encouraged me to find one thing to learn about money and use that to build momentum. Like the simple goal of reading one book, it doesn’t really matter what area of money you choose. The point is to pick a topic, become confident about it and move on to another topic. Maybe you have debt and don’t know how to start paying it off. You can research ways to pay off debt and start attacking it. If it’s investing, research how to start investing and start putting away money. Again, it doesn’t matter the area, just pick one and run with it. Losing weight, or getting in better shape, is one of the most popular New Years resolutions. I know it was one of mine for years and I never saw success. It wasn’t until I decided to take my health seriously that I began the process of losing 100 pounds on Nutrisystem. Don’t give in to the belief that you need an expensive gym membership to lose weight. I lost all my weight without stepping foot in a gym and simply exercised at home. In fact I started my fitness regime by walking around the neighborhood. As I began to lose weight and build confidence, my exercise routine increased to doing circuit training and riding an exercise bike. Find something you like to do for exercise and just start. Pair it with better eating choices, and you’ll be surprised at how much better you feel, which becomes addicting. We love TV. The Bureau of Labor Statistics (BLS) reports that the average adult watches nearly three hours of TV per day. That’s an average, of course, so you may be above or below that statistic. Talk about wasted time, especially if you’re doing nothing during that time but tuning out. If you’re finding yourself short on time or would like the opportunity to do other things this year, consider trimming down your tube time. You can start small, maybe in 15 or 30-minute increments, so it’s not a shock to your system. There are many things to do besides watching TV, so I know you won’t be at a loss of finding things to do. Like many of these other goals, you’ll be surprised at how quickly you can build momentum – not to mention how great it’ll feel to have all that extra free time. We hear a lot about cutting bills in personal finance, and for good reason. Many of us overpay for far too many things. That’s money that could be put toward other areas of need. Instead of doing a complete overhaul at once, find one bill to cut. You can even try a few different ones at the beginning of the year to see which one causes you the least amount of pain. You can use a service like Trim to help you find subscriptions you don’t use and cancel them. Take the savings and do something more productive with the cash. If you need ideas, here’s our list of 35+ ways to save money every month that will give you plenty of ways to start slashing. Saving more money is one of the best simple goals to set. It can be anything from the need to build an emergency fund to paying off debt. Regardless of what you’re saving for, commit to saving a certain amount each week or month. The amount really doesn’t matter. If you can only start small, say $10 or $20 at a time, do that – but quantify it to increase the chance of success. It also really doesn’t matter the reason, whether it be to build a savings cushion, pay off debt or save for a vacation, the point is to save so you don’t have to rely on a credit card. Once you decide on the amount, open a savings account to stash the money. Ally Bank, for example, allows you to start with no minimum balance and pays at least 1.25% on your savings. To increase your chance of success, commit to automating the savings, so you don’t even feel the cash going into your savings account. ‘Free money,’ you say? Yes, there is such a thing as free money, and that’s with your employer-sponsored 401(k) plan – IF they match your contribution. Saving for retirement can be a challenge, especially if you are investing on a low income. Many, myself included years ago, use that as a reason not to invest or save for retirement. When you give up on a 401(k) match, you’re giving up free money. I know it may be scary, but talk to your Human Resources department and ask them how to start using your 401(k). After you do the little bit of work required to set it up, it’s all automated for you and will hum along in the background. At the end of the year, you’ll have 12 months worth of saving built up, and you’ll feel great seeing how much you have saved for retirement. If you don’t have access to a 401(k), you can still start investing – even with little money. Ally Invest lets you start investing with no minimum balance and an industry-low $4.95 per trade. The New Year is full of opportunities. You want to challenge yourself, but you also want to be realistic. There’s nothing wrong with starting small, or having fun while working towards your goal. I believe that the combination of a quantifiable goal with some personality and fun is the best way to be effective, which will help you have a great year. What is one goal you’re planning on working toward this year? How do you break down your goals to increase your chance of success? What is one goal that always seems to elude you and how do you plan on attacking it in 2018? 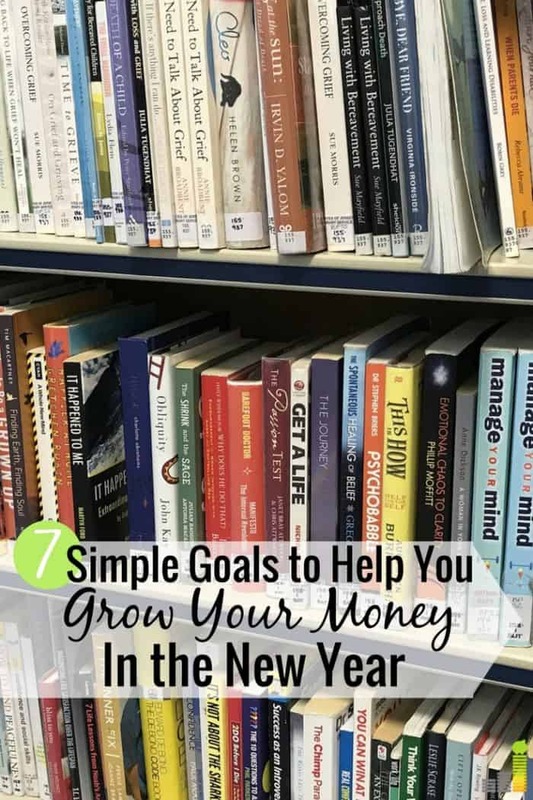 The post 7 Simple Goals to Focus on to Have A Great Year appeared first on Frugal Rules.